As you all know by now, WaterField has been in the business of perfecting bags and sleeves alike for many years now. And if you don't already know that, or WaterField for that matter, you're missing out! It has been a few months since we last reviewed a bag made by WaterField, and that was the oh so delicious Muzetto portable leather bag. The Muzetto was a bag that has set a very high standard in my book and it has made me expect a whole lot from WaterField when the Cargo landed on my doorstep straight from the San Francisco factory where it was born. The Cargo has met my highest expectations the moment I pulled it out from within its packaging, let me tell you that. WaterField's Cargo is not the latest and greatest, and has been around the block for quite some time now. Such a bag like this is worth our attention and vigorous review though. 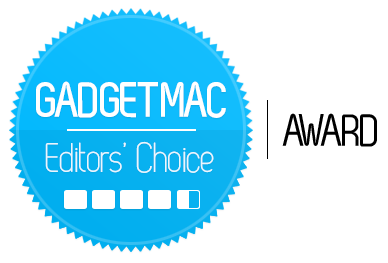 The full review is waiting for you just past the jump! The Cargo is not your typical run of the mil bag, it's actually a special messenger bag with a unique style and design that sets it apart from the rest. The good folks over at WaterField have sent us what they call the "Mambo Combo", which is a bundle that includes the Cargo bag itself along with a SleeveCase laptop sleeve of your choice, as well as a Cableguy gear pouch. If you decide on going with the Cargo Mambo Combo, it will set you back between $219 - $309, depending on the styles and Cargo size you select. 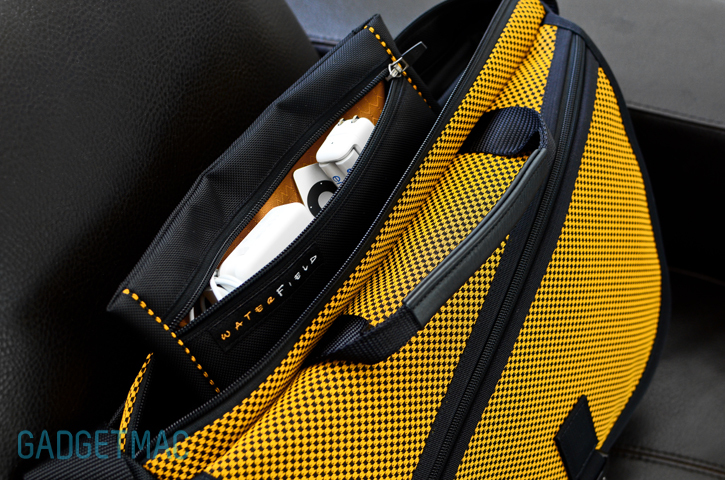 What we're reviewing here is the medium Cargo bag in a Taxi Indium, SleeveCase with leather trim that we've already reviewed here and a Cableguy pouch in a Taxi Indium trim. Sounds confusing? I bet so. WaterField lets you pick thru many options which is always fantastic. If a New York, yellow/orangey taxi color isn't exactly your cup of tea, the Cargo comes in a choice of 4 different Indium colors, 5 different leather colors and in a more simplistic black ballistic nylon. Starting off with the little guy, the Cableguy gear pouch. If you decide on getting this by itself, the Cableguy alone runs for $19 - $25, depending on which size you choose. The Cableguy is really an organizer pouch that you can stow away all of your important cables, power adapters, batteries, memory cards and really anything small enough to fit inside that you want to organize all in one spot. I was able to fit quite a lot in this medium sized Cableguy gear pouch, and that's without even using the back zippered compartment which is also identical in size to the front. WaterField uses a golden colored interior that brightens up the insides and actually makes it easier to find what you're looking for. Like all WaterField products, the Cableguy is made from a very durable ballistic nylon material with an Indium trip so you can match it with any WaterField bag. Talking about build quality, the Cargo is built like a tank using ballistic nylon. The very same material used in bullet-proof vests. It's tough, rugged and very well stitched together. WaterField has ever added stiffening liners inside the Cargo's construction to help keep its shape contained without it being flimsy like almost any other messenger bag you would find. All of this durable construction makes up for one incredibly solid feeling. It makes me feel confident tossing this bag around with all my valuables inside without having the slightest bit of worry. That's exactly what I want in a bag. All this superb solid build translates into a pretty hefty starting weight though. I suggest you buff yourself up a little more to match up. 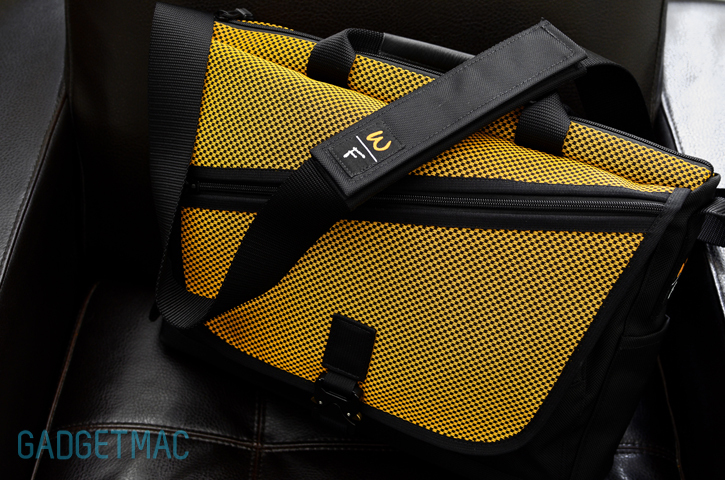 Such a bag like the Cargo was designed to be more than just your ordinary messenger bag. In addition to the very well padded and anti-slip should strap, there are two beefed up carrying handles which make carrying the Cargo around with you much more comfortable than most other messenger bags with poor handles that were put there as an afterthought. The shoulder strap can be easily adjusted thanks to the side strap buckle. Shoulder straps always tend to slip off of my shoulder, but I'm glad that with the anti-slip padded shoulder pad, I had no such issues. WaterField has really shown their attention to detail in the Cargo. In turn, you can use the Cargo for virtually any type of occasion. There are two types of buckles to choose from when ordering the Cargo bag. One is an aluminum buckle similar to the ones you would find on an airplane, or you can pay up an extra $10 and get a much better looking paragliding buckle like the one we've got on this Cargo bag which compliments it very well. It too is made from solid aluminum and not only does it look great, it's a blast using and opens up as smooth as butter. It's so easy to open and close that you can do it all with one hand. Simply pull down on both the brass latches to unlock the buckle open. Trust me, you'll want to do it all day long. It's that addicting. I wouldn't want any other buckle to be on the Cargo other than this one. Another cool idea WaterField had when it designed the Cargo bag was this slanted front zipped compartment which is conveniently places on the flap and gives you a quick access to some of the stuff you decide to store inside of it. For example, you'll be able to slip a Kindle and even an incased iPad or any other similarly sized tablet into that front flap zippered compartment, and you'll still have plenty of room left for a few other things. They don't call it the Cargo for nothing I guess. If we open up the Cargo's flap open, we're greeted with a few inner compartments that are protected and secured by the Cargo's flap and buckle. The big oval shaped, zippered compartment is big enough to store an Apple Wireless Keyboard, pens, your mouse and even a portable tablet stand like the Slide. But really, this is just to show you an idea of what's possible to store inside and you can obviously tailor it to your needs accordingly. This is where I would also store even more important things like small documents, passport, plane tickets and so on. 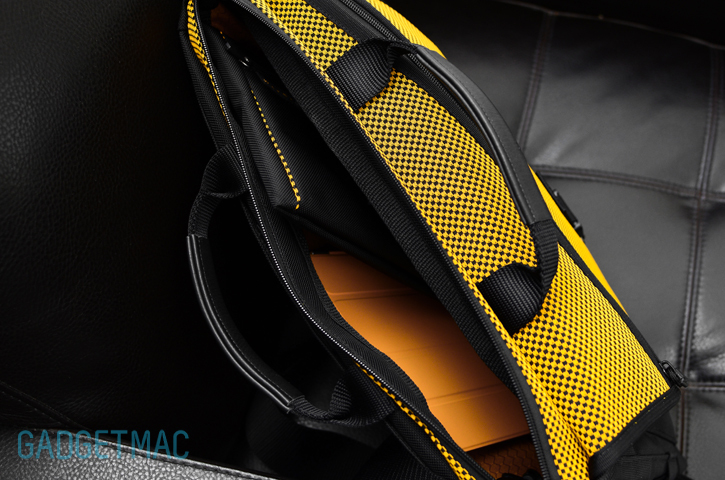 You can see the interior is lined with a bright, golden honeycomb nylon liner that lets you see things inside more easily instead of a pitch black compartment. In addition to the zippered compartment, you'll find two large pockets right behind the zippered one, each wide and deep enough to fit a Kindle each. No "that's what she said" jokes please. Or you could use one of them to slip your smartphone in. Again, it's really up to you and your imagination. Finally we get to the Cargo's main compartment. The one you will use to fit a laptop up to 15" if you opt for the medium sized Cargo that is. 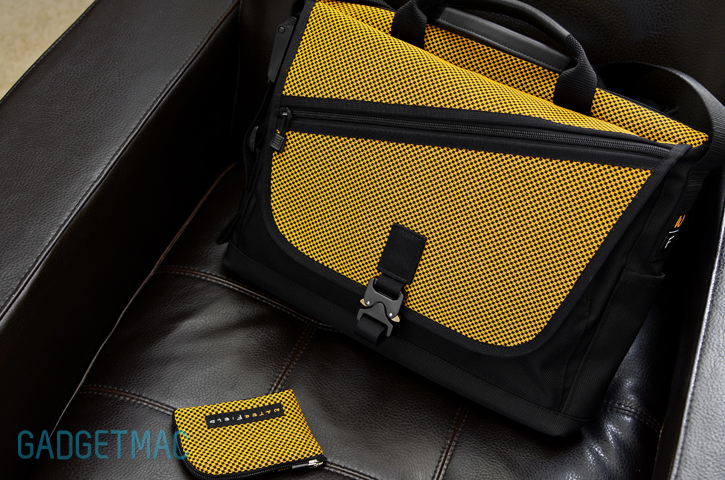 Like I mentioned before, the main compartment isn't constricted by the traditional messenger bag styled front flap that you would otherwise need to flip over each time you want to take out your laptop, tablet or whatever have you. A zipper is much more convenient I think for such occasion, and it works really well if you decide to carry the Cargo in a non-messenger method. To give you an idea of what you could potentially fit inside the belly of the beast, I was able to fit a 15" MacBook Pro while inside the WaterField SleeveCase which is a pretty bulky sleeve in its own right, along with an iPad 2 and I didn't even forget about my Cableguy gear pouch that I filled with little, yet important goodies that I was able to fit inside the main compartment. Three individual pockets on the inside will let you store such things as an iPod, glasses, a few pens and business cards. It might look like a narrow compartment, when it actually is much bigger on the inside. The stiffness of the Cargo's construction constricts the opening of the main compartment a little. Come on, it's the bag that will never ever sag on you. After all that was said and done, there was still some spare room left. If I hadn't used the SleeveCase, I could have also fitted a MacBook Air inside. I would however, recommend using a sleeve for your laptop just because the Cargo's main compartment is not padded or specially designed to cradle a laptop. It's one big space waiting to be filled. The inside is also lined with a golden liner, but only on one side which is a bit of a letdown since it's the main compartment. Last but not least, around the back of the Cargo is where you'll find a large single top compartment suitable for magazines and paperwork with a velcro secured enclosure. Or if you don't want to carry a bunch of stuff with you, you can unzip the bottom and easily use that back compartment to slip the Cargo onto the handle neck of your wheeled luggage. I honestly wouldn't pick any other bag to carry around all of my gadgets for my trips, just because there is no other bag like the Cargo. Like all of WaterField's offerings, the Cargo was built to last you a lifetime. The medium sized Cargo bag is perfectly sized, not too big and not too small with plenty of space to carry all that you need with you anywhere you go. One thing I would have liked to see added to the bottom of the Cargo are a few rubber feet to add more protection against potential wear and tear. At $209 for this particular Cargo, this is one brilliant messenger bag I think anyone will appreciate.